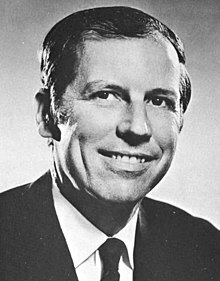 William Forrest Winter (born February 21, 1923) is an American attorney and politician; he served as the 58th Governor of Mississippi from 1980 to 1984. A Democrat, he is known for his strong support of public education, freedom of information, racial reconciliation, and historic preservation. Winter served in the US Army during World War II in the Philippines. He was elected to the state legislature in 1947 while still in law school. He also served again during the Korean War, receiving a hardship discharge in 1951 after his father had a heart attack and his mother needed him on their family farm. After the war, he served in the Mississippi National Guard with the rank of major, until 1957. Born in Grenada, Mississippi, Winter attended local public schools for his basic education. He is a graduate of the University of Mississippi. As an undergraduate, he was an active member of the Phi Delta Theta fraternity. As a junior class student, Winter was elected president of the Hermean Literary Society; Phi Eta Sigma, a scholarly fraternity; and the International Relations Club. :32 After serving in World War II, he returned to graduate school. He graduated from Ole Miss law school, where he served as Editor of the Mississippi Law Journal. Winter first entered politics in 1947. While in law school, Winter was elected to the Mississippi House of Representatives. He was subsequently re-elected in 1951 and 1955. He was appointed as Tax Collector of the State of Mississippi as well as State Treasurer. In his early days as a representative, he was appointed as a Trustee of the Mississippi Department of Archives and History; Winter continued to serve on this agency board throughout his public and private life. His former law firm partner, Kane Ditto, who was elected as mayor of Jackson, Mississippi, has replaced Winter as the Chairman of the Mississippi Department of Archives and History Board of Trustees. During his term as Lieutenant Governor, Winter served as an ex officio member of the Mississippi State Sovereignty Commission, which was established by the legislature in 1956 to maintain segregation in the state. Its records remained sealed until 1998. Although major national civil rights legislation was passed by Congress in 1964 and 1965, Winter ran for the Democratic nomination for governor in 1967 as a segregationist. He said he wanted to focus on "bread-and-butter issues, not the old emotional ones—not racial issues." He lost the bitterly contested race to John Bell Williams in the runoff for the primary. Because most African Americans (and Republicans) in the state had been disenfranchised since the turn of the century, the primary was the important competitive election. Winter was elected and served as Lieutenant Governor from 1972 to 1976. He lost the Democratic nomination for governor in 1975 to Cliff Finch. But he won the nomination in 1979, having defeated Evelyn Gandy, the departing lieutenant governor; Jim Herring, who was later the state Republican chairman; and several other intra-party opponents. After winning the Democratic primary, Winter handily defeated the Republican nominee, Gil Carmichael of Meridian. Winter served as governor from 1980 to 1984. After finishing his term as governor, he ran unsuccessfully for the United States Senate against the one-term Republican incumbent, Thad Cochran. During the senatorial contest, African-American support for Winter weakened. State Senator Henry Kirksey demanded Winter's support for major changes: to reduce the number of at-large municipal election seats (which tended to disfranchise minority voters), to open the records of the State Sovereignty Commission (which had been kept secret), to make further education reforms to ensure quality education for African Americans, and to end racial gerrymandering in local political districts. Winter returned to the practice of law after being in office. He works as Special Counsel in the Government Relations Practice Group of the law firm of Jones Walker of New Orleans, Louisiana, with offices in Jackson, Mississippi. Winter was appointed as a member of President Clinton’s Advisory Board on Race in 1997-1998. The William Winter Institute for Racial Reconciliation, on the University of Mississippi's Oxford campus, is named in his honor, as is the William F. Winter Professorship in the Department of History. In March 2008, Winter was given the Profile in Courage Award by the John F. Kennedy Presidential Library and Museum for his work advancing education and racial reconciliation. ^ a b Bolton, Charles C. (2013). William F. Winter and the New Mississippi: a biography. Jackson MS: University Press of Mississippi. ISBN 978-1-61703-787-0. ^ Baskin, Bethany Lamar (1992). The Rise of William Forrest Winter (MA thesis). Mississippi State University. ^ a b Gibson, Nola Kay Pearson (1993). A Biography of Governor William F. Winter With Emphasis on his Contributions to Improve Education in Mississippi (PhD thesis). University of Mississippi. ^ Saggus, James (22 May 1977), "Sovereignty Files Sealed, Said Secure", Clarion Ledger (Jackson). ^ Atkins, Joe (7 August 1984). "Seeds of black rebellion threaten Democrats, Winter", Jackson Daily News (Jackson). ^ "William Winter". Jones Walker. Retrieved 2012-01-10. Bolton, Charles C. (2013). William F. Winter and the New Mississippi: A Biography. Jackson MS: University Press of Mississippi. ISBN 978-1-61703-787-0. Winter, William F. "William F. Winter." In Growing Up In Mississippi, edited by Judy H. Tucker and Charline R. McCord, 3-10. Jackson: University Press of Mississippi, 2008. This page was last edited on 21 February 2019, at 15:13 (UTC).